There are a lot of business-related shows around. Try differentiating yours from the others in your niche. What specific business-oriented topics could you focus on for 30 to 60 minutes? Is it marketing, budgeting or improving your business? Organize strong, unique content concerning that sub-niche to help your show to stand out. Regularly listening to other similar business-related shows will not only help you in differentiating yourself, but could also help you stay up-to-date with the new trends in the business industry. By listening to other business podcasts, you could gain inspiration in interviewing techniques and storytelling. You could also network with other podcasters for advice or engagement. In order to organize unique content within your niche, you must have a content strategy in place. By developing a strong content strategy, you will be achieving your goals and staying accountable and on track for your show’s future. Creating a podcast content strategy for your show can set you on the path to success. What is the overarching purpose of my business show? What kind of content will resonate with my audience? How often will I release a new episode? The answers to these questions will help in developing a strategy for your show’s content. Struggling to keep track of your podcast production? Worry no more! Subscribe to our mailing list to grab our free podcast production & scheduling tracker! 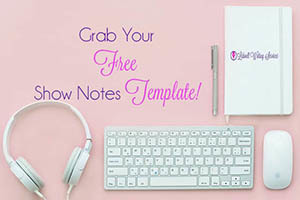 You’ll also receive periodic emails with new content, tips, strategies, and ideas you can use to launch, promote, and monetize your show as well as exclusive offers and promotions from LWS! Starting a podcast is a lot of work. In addition to organizing the content for it, you have to organize your workload. This requires creating a schedule. How often will you need to book guests for the show? How much editing will you need to do? You also have to take into account the duration of new episodes being released. Podfading is defined when a podcast host suddenly decides to stop recording episodes for her show. This has happened to many shows and there are plenty of factors causing this to happen. It could be the host has simply run out of episode ideas or other responsibilities or tasks start to take priority. How could you avoid falling into this trap? If you start to get burned out of content ideas, try writing down a list of topics and subtopics you could discuss on your show. If life starts to get in the way and other responsibilities start to crowd your time, try outsourcing various post-production tasks such as show note writing, audio editing, scheduling and managing social media, and guest sourcing. Once you decide how much editing you need to do, now it’s time to actually get started on it. When editing your episodes, it’s vital that you do so carefully. Consistent failing in editing your shows could be detrimental for your podcasting future. Don’t be afraid to chop down on some unnecessary filler when conducting an interview on your show. Just be sure to keep the compelling and interesting parts of that interview. Because many podcast hosts integrate interviews in their shows, sharpening your skills in this department isn’t such a bad idea. Try doing some practice runs with someone before you’re ready to get behind the mic. Listening is a huge part of being a successful interviewer. So it is vital that you listen to what your guest is saying in order to keep the conversation flowing naturally. By keeping your skills sharp, you will be on the road to a show that stands the test of time. One of our past posts highlights one of the biggest mistakes of a new podcaster is inconsistency. Being consistent with the amount of episodes you release a week is like being consistent with how often you post on your blog. In order to generate a growing audience, you must be dedicated to giving your audience what they want: informative, useful content. Take your time and start planning each episode carefully. Take the time to consider how long you want them to be and what days you want them to air. Don’t make your audience guess when you’re going to drop a new episode. Starting and maintaining a business podcast isn’t easy. In fact, it takes time, preparation, organization and dedication. But if you stay consistent and apply the tips in this article, you will likely have a successful, long-running show. Do you have a successful, long-running business podcast? Have some additional tips you’d like to share with our readers?